The UN World Food Programme (WFP) is appealing for 6.5 million dollars so it can provide life-saving airlifts of food to starving refugees in South Sudan. WFP relies entirely on voluntary donations from governments and the public. WFP wants to air drop 2,000 metric tons of food into Maban County to make sure civilians fleeing fighting in Sudan’s Blue Nile State have enough food to survive. These refugees have fled to the Upper Nile State in South Sudan to escape the violence and find aid. 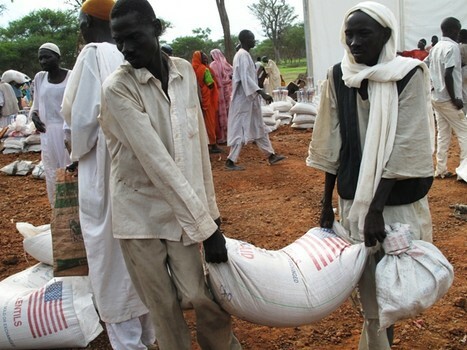 WFP also plans to air drop 3,000 metric tons of food to the Yida refugee camps in Upper Nile State. The number of refugees there is fast increasing. Malnutrition rates, particularly among children, are alarming according to WFP and other aid groups. If children do not receive enough nutritional support they will suffer lasting physical and mental damage. The air lifts of food become necessary because of the poor roads in South Sudan, many of which become impassable when rain hits. Food that was pre-positioned in crisis areas by WFP was not enough because of the fast increasing numbers of refugees. Challiss McDonough of WFP says “we do hope that the donors will recognize the importance and urgency of this situation.” WFP needs funds to provide the airlifts and also to maintain a steady flow of food supplies. The longer the conflict continues between South Sudan and Sudan the more food aid will be needed to save lives.